It is fair to say that very few homes these days are without a television. Although you might not necessarily want your TV to be a focal point in your living room, you definitely need to take the television’s location into account when designing a living room layout. Planning the TV location means ensuring that it doesn’t distract from the other living room focal points, such as a fireplace or exterior view. Another important factor should be TV height — position your TV too high or too low and not only will it look all wrong, but you will also end up with neck ache. Wherever you end up positioning your television, there is one good design rule to abide by — the centre of the TV screen should be at eye level of the viewer. Although this sounds pretty straightforward, you need to take into account the average height of the people in your house who will be watching the TV, the TV size and the seating height in your living room. As a general guide, assuming your sofa is of average height and that your TV is not massively oversized (or tiny for that matter), the ideal TV height is achieved by ensuring the centre of the screen is around 42 inches above the floor. This very much depends on the TV size you have chosen, although the dimensions of your living room need to be kept in mind too. There are several interior design rules surrounding this one. Traditionally, it was recommended that the sofa be placed at a distance two and a half times the diagonal length of the TV screen. As an example, a 55- or 60-inch TV would be ideally placed 12ft away from the sofa. However, all the design rules in the world shouldn’t overrule personal preference so work out what works best for your and try out several different layouts before settling on a final position and ideally before choosing a TV stand. 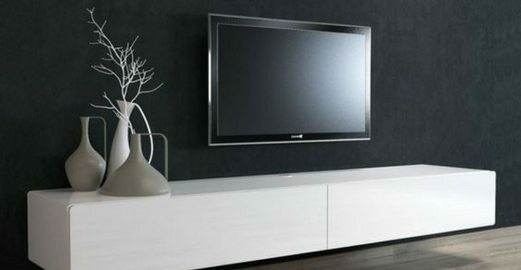 Once you have calculated the best height for your TV in relation to seating height, you can think about TV stand height. The TV stand you choose dictates the height at which the TV will be set so this is an important decision. Low sofas and chairs require low TV stands and vice versa. It is also often possible to customise a coffee table in order to tweak the height. For example, something like the ZeStretch TV stand, is a relatively low 36cm without the addition of the optional feet, which bump it up to 47cm high. For something even higher, this Modern TV stand is 60cm high. Fixing the television over the fireplace is currently a popular trend. However, it obviously cases issues when it comes to optimum viewing height — most seated viewers will be much lower than the space above the average fireplace. However, sometimes it makes sense to prioritise the overall look of a room and if the TV over the fireplace is a look that works in your home, then go for it. In this scenario, the larger the room the better — larger living rooms allow you to place the sofa further away from the television meaning less neck craning. If you are designing your living room from scratch and like the idea of a TV over the fireplace, consider a low, long fireplace set into the wall. This allows you to place the television lower on the wall.